Great article in the Champion today, with an interview with Milton Cycle Network founder Bogdan Kowalczyk (much better than the awful “bad hair day” clip of me in that piece on CHCH last week, I think). So, what do YOU think about this velodrome idea? Great for promoting cycling, or money better spent elsewhere? Milton’s abundance of escarpment trails make it an oasis for mountain bikers, and road cyclists certainly make use of the town’s quiet rural roads. 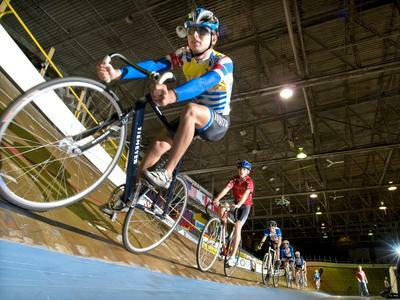 With council now contemplating bringing the Pan Am velodrome to town, Milton can potentially attract even more area–cyclists. But is enough being done in town to make cycling a viable alternative to cars? One local cycling enthusiast says no. Kowalczyk submitted a cycling strategy essay to the Town this spring, which he said garnered no response. He suggests building segregated cycling lanes along major roads and creating a “bike train” with GO Transit to bring cyclists from surrounding cities and towns to bike along the escarpment are two ways the Town can encourage active transportation and “cyclo-tourism”.